On Sunday 20th May the Southern region held a farm visit by kind invitation of Ashton Selway at Stourminster Newton, in Dorset. 41 members and friends from as far as Cornwall and Surrey attended and were treated to an exception day. After tea and biscuits on arrival at 10 am, Ashton gave a guided tour of his farm. Starting with his flock of Zwartbles he had separated a pen of Shearlings with their lambs from the main flock and gave a talk on the merits of his lambs, his experience in breeding and what to look for in a good ewe he then answered a variety of questions from the assembled group. Ashton runs three farms with 300 hundred cows and flocks of Lleyns and Charolais as well as his Zwartbles. 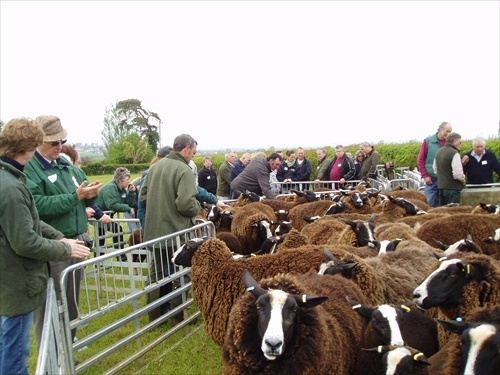 Next was a pen of ten sheep which had been shorn in preparation to be taken to the South Sheep event at 13th June 2012 at Nugent Farms Ltd, Upper Lambourn Berkshire where the Association will be exhibiting. We were then taken to the extensive milking parlour complex where Ashton milks three hundred cows. He gave us a talk on his enterprise including feeding, calving, winter housing etc. We then walked through the feed and bedding areas with Aston providing running commentary all the while. 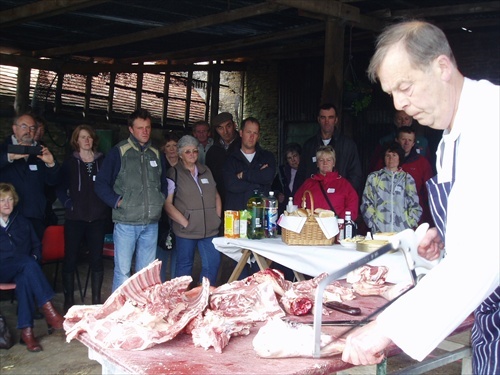 Following this excellent tour we then assemble in a barn where a local butcher gave a demonstration in butchering a lamb into all the various cuts and answered questions from the intrigued gathering. An excellent barbecue lunch followed cooked up by Mike and Anne Simpson with a wide array of sweets and drinks on offer to round off. Hand made local and animal supplements were on display for purchase. The afternoon concluded with a group discussion where various topics were discussed including the autumn meet where it is being suggested a visit to Adams Farm. The group presented Ashton with a hand made dog collar and Maureen a basket of roses in appreciation for their hospitality the visit ended at 4 o'clock.